All images by Ed Ng Photography unless otherwise noted. Where and when did I meet Dominique Hanke? I no longer remember. One day, she came into my world and things have never been the same. I don't think people perhaps fully understand how hard she works and how much of herself she gives to the community. This modern woman manages to balance family - husband and two children - and supporting the local fashion industry by attending numerous events (I think she makes it to more than I do) all while still finding time to style numerous fashion shoots. Are you tired yet? You should be. Now add entrepreneur running her own business and artist to the list. 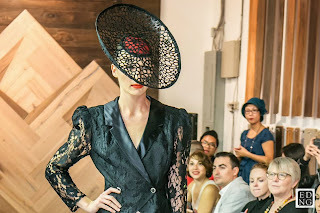 Hanke moved from England to Vancouver in 2007 and by 2011 had launched Hive Mind Millinery. Her unique take on what a hat could be quickly gained media attention and the line is now a regular on the runway as well as frequently featured in blogs and magazines. Recently New York called. Hive Mind hats were front and centre at Fashion Designer Sho Sho Esquiro's show during Couture Fashion Week (a young native designer who spotted Hanke's designs in a Georgia Straight article and who she has collaborated with ever since). Hanke was able to be there in person to bask in the glow! It had to be incredibly exciting. And all this has come about in only two years! My question - where does she find the time for inspiration and construction in all this chaos? never waned, but I took a more practical approach to my career, settling on architecture. 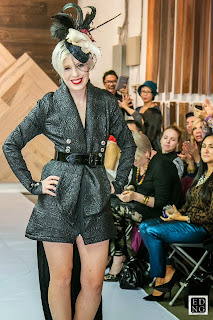 On October 16th, local VIP and media were treated to a preview of the Hive Mind Millinery 2014 Couture and Men's Collections at Frontier Flooring on 8th in Vancouver. The space was set up with room for everyone to sit and still have a great view. Mistaken Identity Vineyards was on hand offering white wine to sip and She to Chic Beauty Lounge handed out spa vouchers to attendees. The room was wall to wall with a who's who of people from the local fashion scene as well as VIP industry supporters. It was hugs all around - one of my favourite parts of any event - but it took quite awhile this night to say hi to everyone. Still crossing my fingers no one was missed. While in NY, a conversation with a good friend proved inspiring and helped reaffirm her overall direction. Hanke's desire for Hive Mind is to push the boundaries of what people think about millinery - to give them a new perspective on it as wearable art, with both aspects equally important. The designer shared, "These collections are heavily driven by structure and the qualities of the materials." Kenneth Wyse provided the styling for this event, offering just the right looks to compliment the new millinery collection. 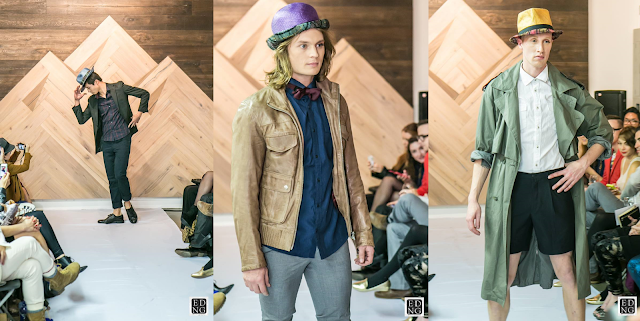 For Men, hat offerings were fun and fresh with a funky vibe achieved through strong colours and textural fabrics. Wyse styled this section with a twist on classic menswear. "A mix of Clockwork Orange meets Chuck Bass." I loved the way the male models offered a bit of extra personality in the way they showed off their hats. Women's couture designs were inspired by 80's/ 90's catwalk - the drama and the excess! I could hear oohs, aahs and gasps all around during the couture section and it was well deserved. Wyse paired these out-of-the-ordinary hats with looks inspired by "...Grace Jones and elitist power women from the 80's." Included were vintage clothing along with some pieces from Evan Ducharme's 68 Pound Challenge for Eco Fashion Week, all in a palette of black and white." My favourite would-die-to-have piece? The black lace number with the small red under cap. Exquisite. However there were several more I covet. For more or to contact Dominique Hanke go to the Hive Mind Millinery website at http://www.hivemindmillinery.com. 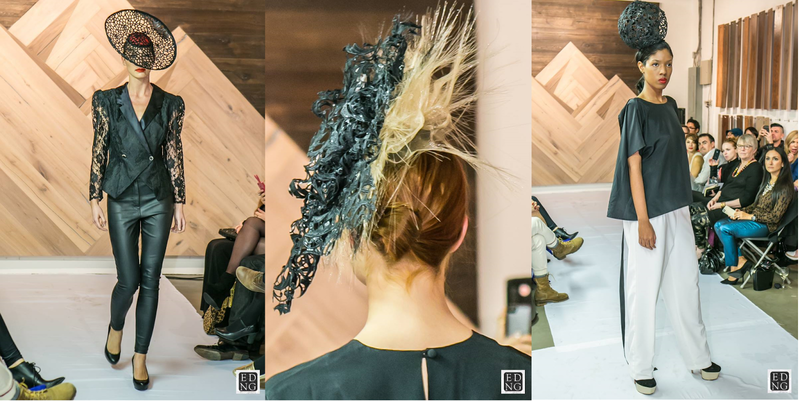 A few pic from Couture Fashion Week by TUR Photography for Bravura Magazine.